Full sister to Trued Up BCR. Looks like a very consistent blood line. She is 80 ttt at 3 yrs. Won 1st in tip to tip in Lawton Ok Horn Showcase and was a Futurity overall champion at Navasota 2018. 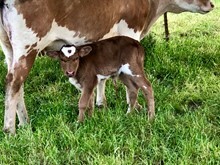 Delivered a Van Horn Texa heifer to continue this great legacy.